Discovering an issue with your homes foundation is nothing short of stressful. If that issue requires repair services from a foundation repairs expert, it’s not only critical that you choose the best contractor to do the job, but no further issues arise after the project is complete. Dalrock’s Home Warranty was designed to give homeowners peace-of-mind about their foundation repair project. You can rest assured that Dalrock will stand behind the repairs for the life of the structure and if you sell your home the warranty can be transferred to the new home owner. In the unlikely event that there is downward movement of any pier installed by Dalrock, Dalrock will step in to make the repairs. 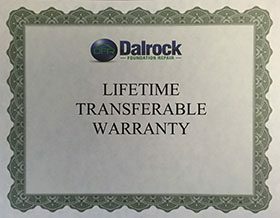 So by choosing Dalrock you are protected by Dalrock’s Warranty. Dalrock provides Warranty protection on 1,000’s of homes in the DFW area. Choose us to make your foundation repairs in Dallas and the surrounding areas! repairs for the life of the structure. for the life of the structure.